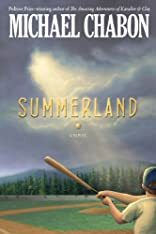 A BookSense 76 pick, and best-seller from coast to coast-Summerland is part fantasy, part adventure, part baseball, but most of all it's the story of a young boy, Ethan Feld-a lousy, but lovable little-leaguer who finds himself playing in the most important baseball game ever. Not only the game, but the fate of the world rests on his shoulders. About Michael Chabon (Author) : Michael Chabon is a published author of children's books and young adult books. Some of the published credits of Michael Chabon include The Yiddish Policemen's Union: A Novel (P.S.). 12/11/2007 Jp B. said: I thought this book was awesome... but not so much. Michael Chabon is a great author. I just don't follow his style religiously the way I would with Stephenie Meyer and JoRow. Recommended to Baseball lovers that also like a lighter version of Spiderwick.